Recognizes a protein of 205 kDa-220 kDa, identified as CD45RA [Workshop V; Code CD45. 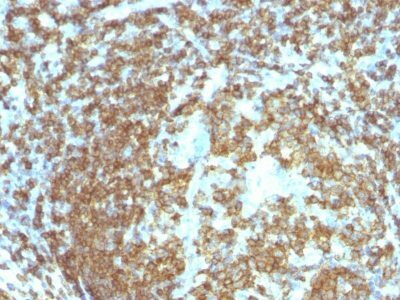 Daudi, Raji, IM9 and human lymphocytes. Human lymph nodes and tonsils. Recognizes a protein of 205 kDa-220 kDa, identified as CD45RA (Workshop III). CD45RA is isoforms of the human leukocyte common antigen (CD45). Human CD45 contains three exons which encode peptide segments designated A, B and C, respectively. The differential splicing of the exons generates at least five isoforms, ABC, AB, BC, B and O. This antibody reacts with ABC and BC isoforms. CD45RA is expressed on 40-50% of peripheral CD4 T-cells, 50% of peripheral CD8 T-cells, B-cells, and leukemic B-cell lines. T-cells expressing CD45RA are naive or virgin T-cells. T-cells expressing CD45RO are memory T-cells. CD45RA and CD45RO define complementary, predominantly non-overlapping populations of resting peripheral T-cells. This MAb is useful in study on the subpopulation of CD4 or CD8 T-cells. It can especially be used to differentiate T-cell lymphomas (CD45RO positive) from B cell lymphomas (CD45RA positive). 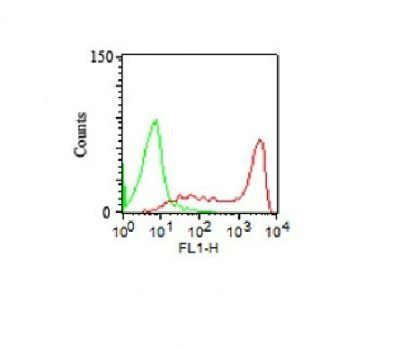 Catalog number key for antibody number 1038, Anti-CD45RA (111-1C5) The prefix indicates conjugation, followed by the antibody number and size suffix.